Since beam sensitive samples are being discussed in the Cs standard topic by Brian Joy and I just had a student run some very beam sensitive rhyolite glasses earlier this week, I thought we might revisit the the Time Dependent Intensity (TDI) correction feature since the student got some excellent results in a very hydrous alkali glass that entailed some very large corrections. This was apparently a Bishop Tuff rhyolite pumice which they suspected from FTIR analysis would have around 5 wt% H2O. So we tuned up the instrument for 15 keV, 15 nA and used a 5 um beam (for the Mg, Ca, Cl, Ti and F traces we used a 50 nA beam). Normally we would use a more defocussed 10 um beam to keep the TDI correction a little more reasonable, but the glass bubble walls were very thin, and as they say "necessity is a mother". So if you are analyzing hydrous alkali glasses (even with a defocused beam) I hope you are turning on the TDI correction feature! We run a lot of hydrous rhyolitic glass, and this has encouraged me to look at zeolites in more detail. 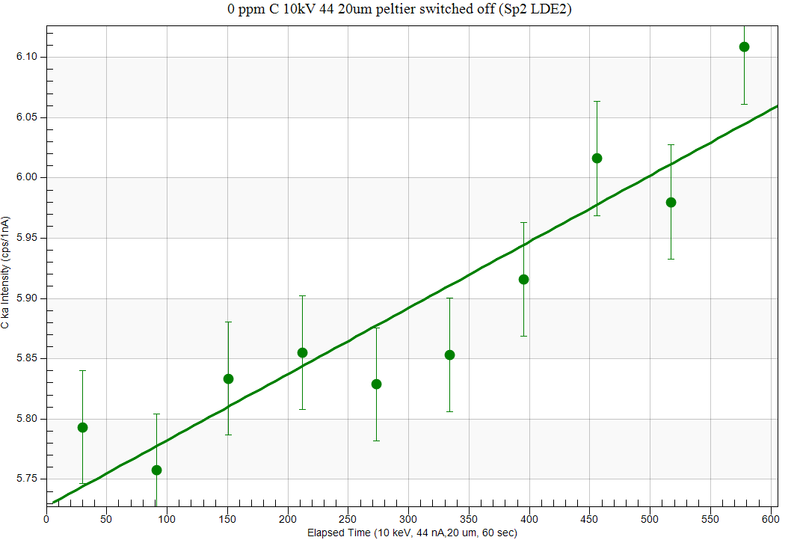 However, I noticed that the time-scale for the self-TDI is a bit funny. Our initial setup is 20 s on peak, with 5 TDI intervals, so the spacing should be every 4 seconds (right?). A JPG of the screen capture of the TDI data is attached. "Elapsed Time (10 keV, 10 nA,5 um, 4 sec)" "Na ka Intensity (cps/1nA)"
It's because the program is recording the elapsed *real time*, not the specified/calculated time. Due to instrument/software latencies and other delays, we have to use the actual elapsed time to get an accurate TDI slope. Dave Adams (USGS Denver) recently sent me an MDB file (probe run file) that he was having a problem with and in sorting that out we noticed (because his run had over 500 unknown samples in it! ), that loading the Standard Assignments dialog was taking longer than one would like. So we optimized the code and now that dialog loads about 5 to 8 times faster, which is nice when one has a very large run like Dave had. Update Probe for EPMA from the Help menu and all will be good. When you say "errors for each TDI point", do you mean the % TDI correction and the % TDI variance for each data point in a sample? In the TDI output to file? It's counting statistics calculated the same way for the error bars in the TDI plots, but always 1 sigma. Yes, they are all 1 sigma counting statistic errors.